Web jargon! It’s hard to keep up at times. The worst is when terms that are supposedly simple are thrown around, and you just sit there at the meeting like this. A web cookie is a small bit of text that is sent to your browser by a server. A cookies purpose is to carry bits of useful information about your interaction with the website that sets them. The browser may store it and send it back with the next request to the same server. This way, the server can distinguish whether two requests came from the same browser. Cookies are specific to a web browser. Therefore, if you use a different computer, open a different browser or delete your cookies, the website will treat you as if you have arrived for the first time (and a new cookie will be set). Remember your settings on a website. Like whether you read the oldest or newest comments first; the volume on the video player, how long you hovered over a specific post, your shopping carts state, game scores and more. 2. To understand how you and other users are using the site. For example, to tell what the most popular news story of the day is. Or to tell how badly you want an airline ticket. Evilness! 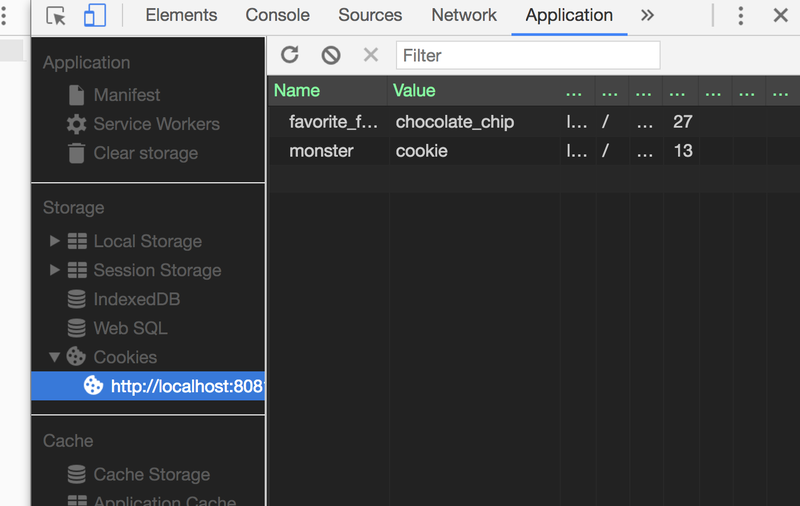 Let’s start seeing things in action by setting our first cookie and examining it in the browser. Great! Now that we have our local dev environment setup and we can start playing with cookies. Let’s start off with setting and getting a cookie in it’s most basic form. Now let’s restart the server so we can see the new changes. Voila! So when we show our document’s cookies we get something almost exactly identical to what we set. What’s the subtle difference? See that semi colon between both key-value pairs? Hmm.. we didn’t explicitly set that. So this is an example of how the browser differentiates between different cookies. By adding a semi colon to it! Our first method will check our cookies for a cookie with the username key and returns it if it exists. This method will check the browser for a cookie with a “username” key. If it exists we will welcome the user. Otherwise we will prompt him/her for their name. Our setter method will accept 3 params. A key, a value, and an expiration date. Cookies are a big part of web development and are something we use everyday as consumers. Hopefully knowing how this works on the development side gives a little more insight into the inner workings of some of your favorite websites. Feel free to follow me on LinkedIn or Github where I regularly post entrepreneurship and tech related content. At CodingStartups. We’re building a community of builders with an emphasis on teaching skills that help you get stuff doooone. Subscribe!